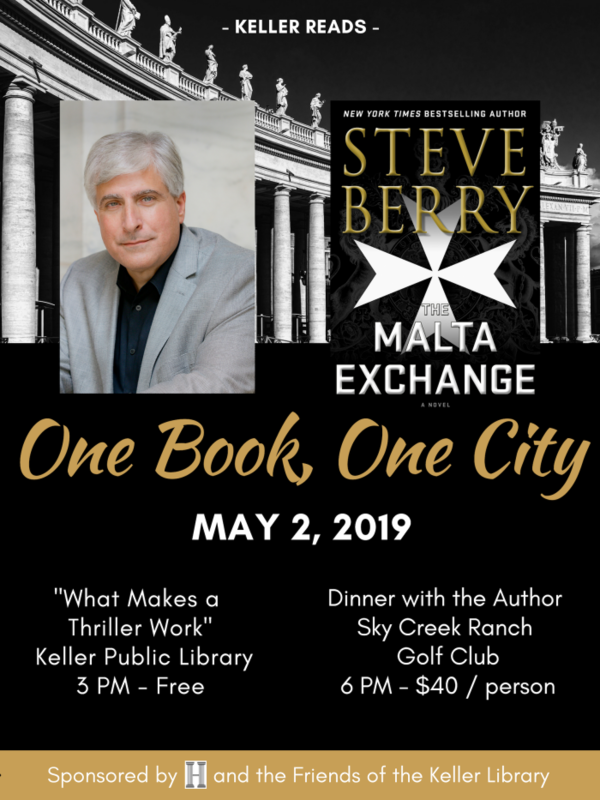 The Keller Public Library is proud to announce The Malta Exchange by New York Times bestselling author Steve Berry as the official selection for 2019 Keller Reads! One Book, One City. The Malta Exchange is book 14 of the Cotton Malone series. In this thriller, the pope is dead. A conclave to select his replacement is about to begin. Cardinals are beginning to arrive at the Vatican, but one has fled Rome for Malta in search of a document that dates back to the 4th century and Constantine the Great. Cotton Malone is after the same relic, as are the legendary Knights of Malta. The hunt is on and the election of the next pope hangs in the balance. Use the form below to purchase tickets now. A processing fee of $1.50 will be added to your order. Please include your name, e-mail address and phone number. Tickets also may be purchased at the bookstore during opening hours starting Wednesday, February 27. Using Amazon's smile.amazon.com generates additional support for the Friends of the Keller Library, at no additional cost to you. Amazon will donate a portion of the purchase price to us if you choose us as the organization you want to fund. Smile.amazon.com is the same as the main Amazon site; same products, same pricing. To shop at AmazonSmile simply go to smile.amazon.com from the web browser on your computer or mobile device. You may also want to add a bookmark to make it even easier to return and start your shopping at AmazonSmile. Additional FAQs at Amazon's website are available here. For the 7th annual Keller Reads! One Book, One City program, the Keller Public Library presented special events with Daniel Bergner. Daniel Bergner is the celebrated author of WHAT DO WOMENT WANT, THE OTHER SIDE OF DESIRE, IN THE LAND OF MAGIC SOLIDERS, THE GOD OF THE RODEO, AND MOMENTS OF FAVOR. He is also the author of the moving story: SING FOR YOUR LIFE: A STORY OF RACE, MUSIC, & FAMILY. Bergner’s best-selling biography explores the rise of Ryan Speedo Green from a troubled, impoverished, and abused child in Virginia to a world-renowned opera star. The New York Times describes it as “a book of great compassion that traces the contours of a single remarkable life” while still “doing something more expansive, examining the long and tormented history of black involvement in an elite artistic tradition and in society at large. Ultimately, this is a story that captures that most inexplicable thing — the human will itself.” So, while this is a story that examines the specific experience of a man who may be strikingly different from many who read it, all who read it will be inspired. Mr. Bergner hosted a discussion of “Sing for Your Life” from 2-3 p.m.. Tuesday, May 22 at the Keller Public Library. And at 6 p.m. that evening, fans listened to An Evening with Daniel Bergner interviewed by Kim Blann at the Bowden Center. Approximately 110 people attended the events. This was the Keller Public Library’s Seventh annual One Book, One City event; in its premiere year, the program featured author Steve Berry and his bestseller “The Jefferson Key.” In 2013, the focus was on Marcia Clark's "Killer Ambition"; in 2014, Deborah Crombie’s “The Sound of Broken Glass”; in 2015, Richard Russo's "Empire Falls. in 2016, Jacquelyn Mitchard “Two if by Sea” and in 2017, S.C. Gwynn, “Midnight of the Summer Moon”. 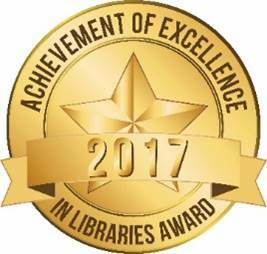 Eighth Consecutive Library Excellence Award! For an eighth consecutive year, the Keller Public Library has been honored with the Achievement of Library Excellence Award from the Texas Municipal Library Directors Association recognizing staff for their commitment to service and educational programming in our community. Only 52 libraries of the roughly 550 public libraries statewide made the cut for this prestigious honor in 2017. The award is given annually to libraries that demonstrate service excellence in 10 areas: Summer Reading Programs; Services to Underserved Populations; Enhanced Services; Marketing Materials; Cultural and Topical Educational Programming for Adults and Families; Literacy Support for All Ages; Collaborative Efforts with Community Organizations; Staff Training; Digital Inclusion; and Workforce Development. The Keller Public Library kept busy during Fiscal Year 2016-17, assisting more than 227,227 customers, circulating 438,874 books, magazines, audiobooks, DVDs, CDs and more. 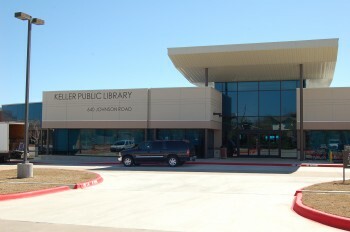 And with hundreds of events and programs annually focused on literacy, computer skills, arts and crafts, and storytelling, it’s no surprise that membership also continues to grow; more than 31,000 Keller residents now have a Keller Public Library card. 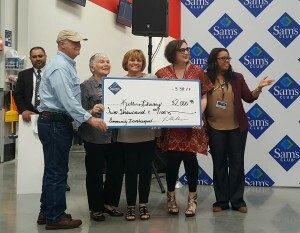 The Friends of the Library received a $2000 grant from the new Sam’s Club in Keller. A big thank you to Sam’s for their generosity. The Friends of the Keller Library is a registered non-profit organization consisting of dedicated individuals who care about our community and the future of our children and grandchildren. 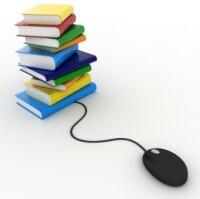 Our mission is to support the Keller Library in its efforts to provide access to information for life-long learning. To do this, we raise funds for the Keller Library, mainly, through our bookstore. Monthly meetings are on the 3rd Thursday of each month at 6:30 pm, usually at the Library. Please stop by and check us out. Buy some books or donate some of your own for future resale. You will find bargains in every category. Another way you can help us in our efforts is to become a volunteer. We need people to staff our store for two hours at a time- either 10am-12pm or 12pm-2pm on Wednesdays or Saturdays. Also, consider becoming a member to show your support of the Friends and the community. You can be an active member (volunteer) or an inactive member. The choice is up to you. Click here to become a Friend of the Library. Members of the Friends work all year to raise money. Although the bookstore is our main source of income, we do receive additional funds from membership dues, donations, grants and fund-raising events. The money is used to purchase items and programs for the library - things that would not be possible otherwise. We especially focus on children, providing materials and financial support for programs throughout the year.